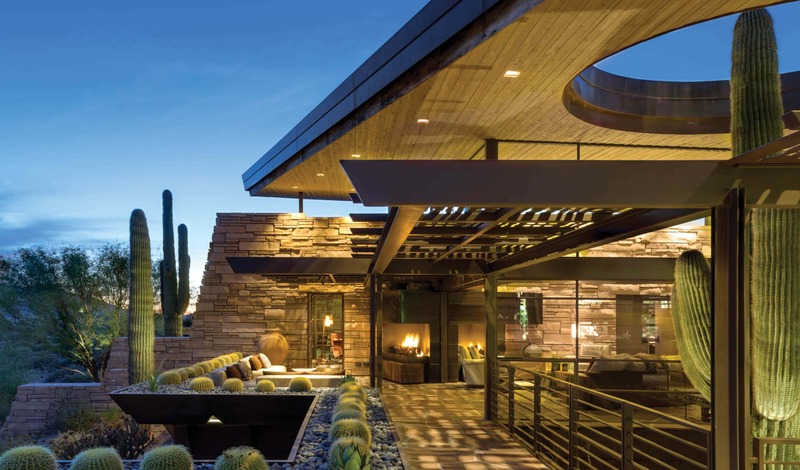 From the outset, this private residence in Scottsdale, Arizona was sure to be a unique one. Paramount were the applications of visually taking in the nearby mountain ridge to frame the vastness of the views, and providing comfort in shade from the sun. The central common space extends and connects to the exterior, blurring the definition of what’s inside and what’s outside. “It is a very special place,” said architect Douglas W. Fredrikson, AIA. 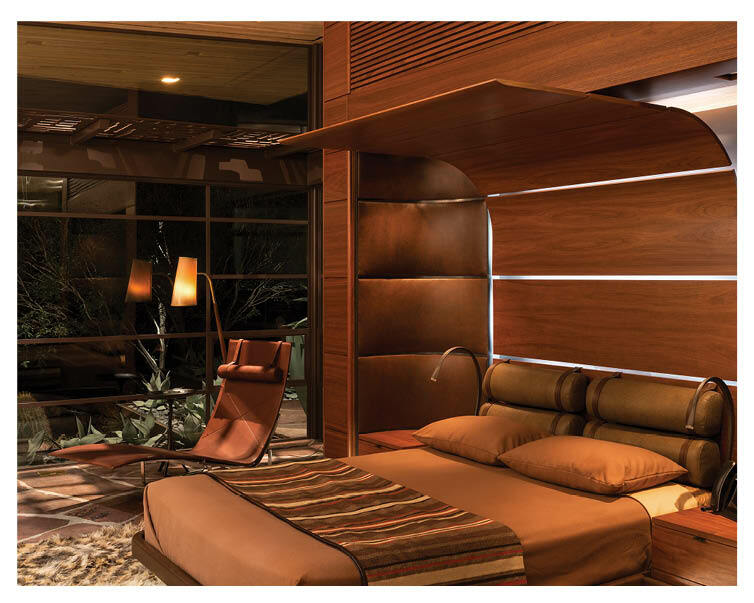 The final result is a warm and casually elegant 7,000 square foot house appointed with copper and black steel details, “rammed earth” plaster, sandstone floors, expanses of glass, walnut walls, and backlit onyx—a family resort in the desert with a little something for everyone at every age. A focal Saguaro cactus surrounded by indoor and outdoor spaces punctures the roof line, merging the structure with the beautiful natural surroundings. The pool cantilevers over the desert wash as it flows down the site. The home showcases twelve fire features, five water features, thirteen courtyard areas, and a rooftop deck providing full 360-degree elevated views. 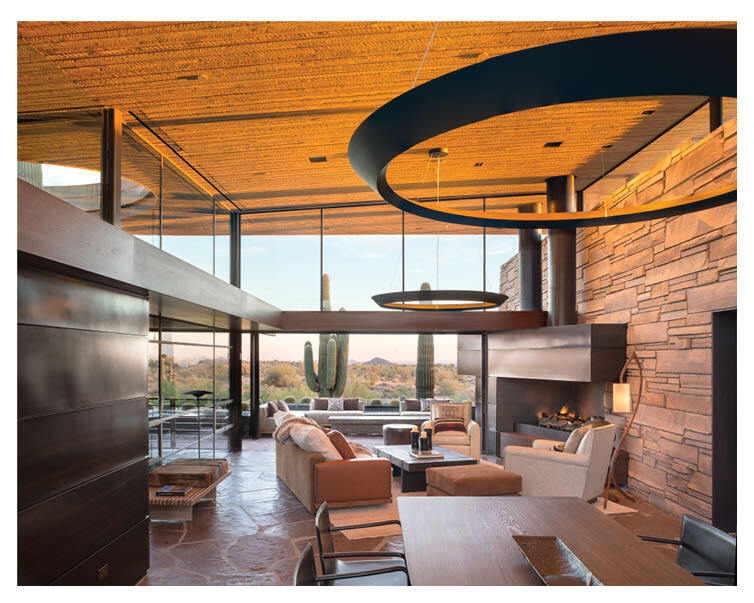 After entering from a covered arrival court and through a garden featuring circular seating near fire and water features, views start to frame the magnificent natural setting in the Arizona great room. 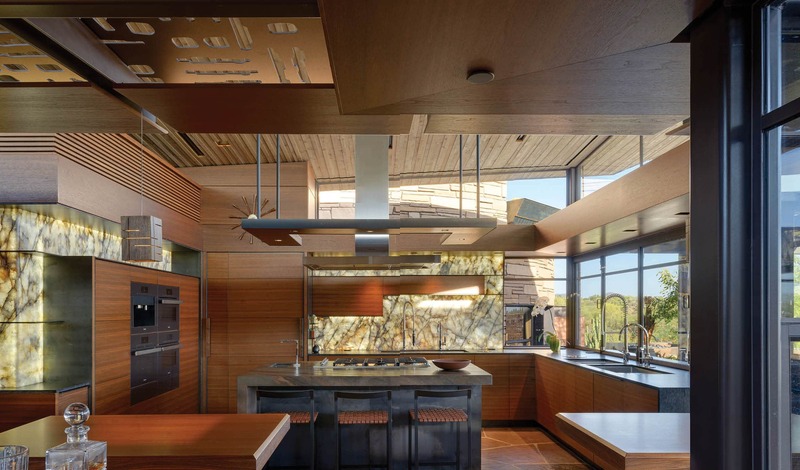 The large kitchen, adjacent to the family room, also opens off to the outside behind the sink, allowing the indoors and outdoors to flow seamlessly together and create a larger space for entertaining. Clerestory windows, high performance exterior glass, and perforated metal shade screens respect the harshness of the summer sun and its warmth in winter, and provide different views and experiences at different times of day.